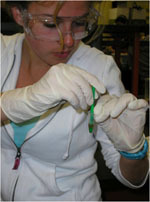 High school student participating in the Discover the Microbes Within project. The majority of information known about Wolbachia has just been discovered in the past few decades, making it a relatively young field in the world of science. Researchers are actively exploring the distribution of insects and nematodes harboring this endosymbiont as well as the associated frequency of infections. Recently, students and teachers have joined in this effort. To find out how you can aid in the discovery of Wolbachia, visit Discover the Microbes Within, an education initiative offering classroom training as well as laboratory internships.